Back on Jan. 22, Intuitive Surgical , maker of the da Vinci robotic surgical system, came out with earnings that pleased investors. Despite a bearish report from famed short-seller Citron Research, Intuitive showed strength, growing revenue by 23% -- mostly due to 25% more gynecological procedures being performed than at the end of 2011. Since then, however, the company has been in a free fall -- down 20% between Feb.1 and March 15. Check out the graphs below and I'll explain the different events that have led to this free fall, and whether investors should be hitting the panic button. The first blip on the radar screen appeared around Feb. 21, when a report came out questioning the benefits of robotic-assisted surgery. Specifically, the Journal of the American Medical Association -- noting a precipitous uptick in the number of hysterectomies performed robotically -- ran some numbers that made da Vinci seem like an unnecessarily expensive surgical option. The report actually showed that while 5.3% of those having a hysterectomy by traditional methods developed complications, the number was actually higher -- at 5.5% -- for patients whose doctors used a da Vinci. Intuitive responded by saying that two key elements were being ignored. First, recovery time was not considered, and da Vinci's less-invasive nature lends itself to quicker recovery times. Secondly, the media generally overlooked another finding of the report: "as use of the robot increased, there was a decrease in the percentage of women who received a traditional 'open' hysterectomy, in which the uterus is removed through a large incision in the abdomen." The second big dip came on the heels of an announcement of an FDA investigation. While the announcement of any FDA investigation is worthy of careful inspection by investors, there is something important to realize here. The impetus for the investigation was a rise in incident reports sent to the agency in use of the da Vinci robot. That sounds pretty bad, until you dig a little deeper. One of the key drivers for the increase in reports came because the company changed its reporting standards. Most of the rise in incidents is due to broken cables that aren't creating harmful side effects to the patients and are remedied quickly. These existed before as well -- it's just that they weren't reported. Although I certainly can't know what's going through the heads of FDA officials, I don't think -- years from now -- the sell-off will be warranted because of this change in reporting habits. But probably the most damning news for Intuitive investors came in mid-March. At the annual conference of the American Congress of Obstetricians and Gynecologists, president James T. Breeden, MD, followed up with the report from the Journal of the American Medical Association. You can read the full text of his statements here, but this is the basic summary: While robotic hysterectomies definitely allow patients to recover faster and leave the hospital sooner than those who have a total abdominal hysterectomy (TAH), there are other, cheaper, just-as-reliable alternative to TAH that don't require use of the da Vinci. What does this mean for Fools? Certainly, it's important to know that hysterectomies make up a large portion of Intuitive's revenue. At the same time, it's also important to take a decades-long view of the situation. If you believe that doctors will continue to tinker with the da Vinci and find ways to make the robot more helpful in different kind of surgeries, than it's worth enduring this short-term volatility. If, on the other hand, you think the real benefits of robotic surgery are greatly overhyped, and that standard procedures will continue to be the preferred mode of operation, then it may be time to sell your shares. Personally, I'm not buying or selling. Intuitive is one of my larger holdings, and I want to wait and see how this plays out. While there are some real concerns, there's also real potential in the company as well. Intuitive Surgical expert Karl Thiel believes a visible path to long-term growth persists. Will Intuitive capitalize, or be crushed by unforeseen pitfalls? His report highlights all of the key opportunities and risks facing the company -- and includes a full year of ongoing updates as key new hits -- so be sure to claim your copy by clicking here now. The article The Anatomy of Intuitive's Dive originally appeared on Fool.com. 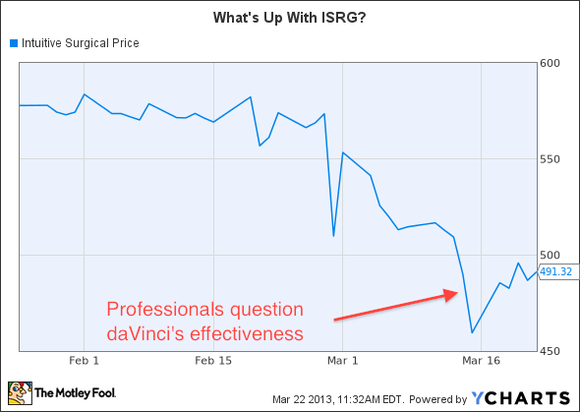 Fool contributor Brian Stoffel owns shares of Intuitive Surgical. The Motley Fool recommends Intuitive Surgical. 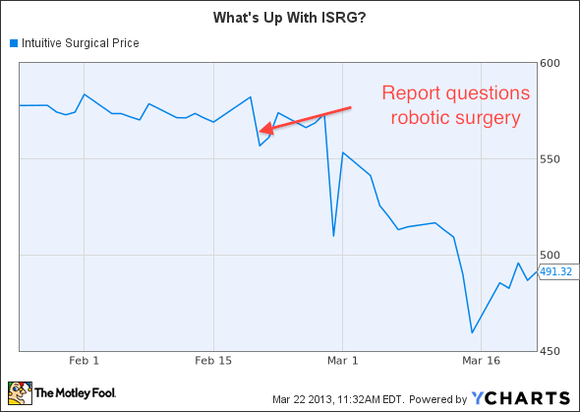 The Motley Fool owns shares of Intuitive Surgical. Try any of our Foolish newsletter services free for 30 days. We Fools may not all hold the same opinions, but we all believe that considering a diverse range of insights makes us better investors. The Motley Fool has a disclosure policy.